Warm weather at our house means motorcycle jaunts, bike rides, and camping trips. 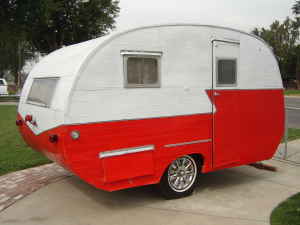 We love to camp and a couple years ago I got us a little “canned ham”—a vintage travel trailer. This is a 1955 Westerner. It’s been a blast decorating this little beauty and camping with her. 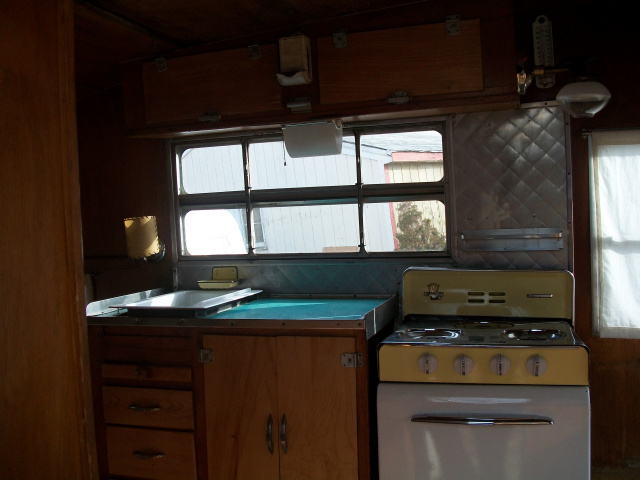 But what hasn’t been such a blast is trying to learn how to prepare meals in this charming home on wheels. You can tell from the picture my “kitchen” is compact. Efficiency has to be my modus operandi. First rule: No sets. Buying kitchen items in sets makes sense financially, so maybe go in with a friend and split the set. But unless you are honestly going to need to store 10 things at a time, the empty containers will just be clogging up your cabinets. Same goes for pots and pans. Be realistic—do you really use a one-quart saucepan and a two-quart saucepan at the same time? Second rule: Forget sentimentality or what you paid for an item. Don’t store anything unless it’s used in multiple ways and almost every day—no matter where it came from or who gave it to you. And that goes for food, too. Keep an eye on expiration dates for long-term items like olive oil. Knowing what is in your cabinet(s), and how long it’s been there, will also save you from buying things you already have. EVERYTHING should earn the space it takes. Third rule: Think outside the drawer. It’s not uncommon for tiny kitchens to only have one or two drawers, so realism must reign. And chances are your drawer isn’t going to be large enough to fit knives, forks, spoons, spatulas, ladles, and all the other utensils that cooks need. The best tactic? Choose one category of items for the drawer, and use crocks or jars to store the others. 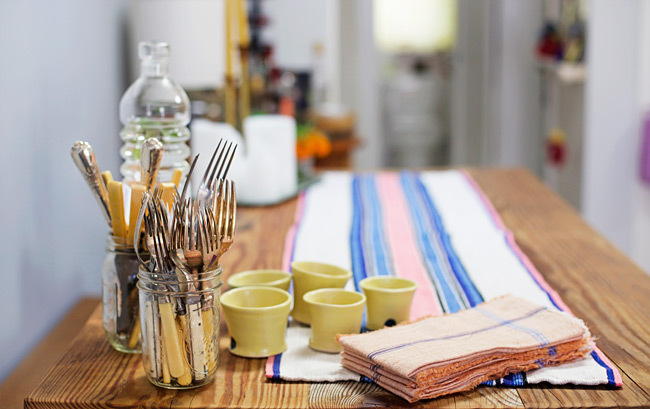 If you have a dining room table consider storing your flatware in a jar right there (makes setting the table a lot easier, too). Or store flatware in the drawer and put your cooking utensils in a crock next to the stove for easy access. In our little trailer we hung a metal planter under the upper cupboard to hold our cooking utensils. Fourth rule: Expand counter space. A smart way to do this is with a butcher block cutting board. 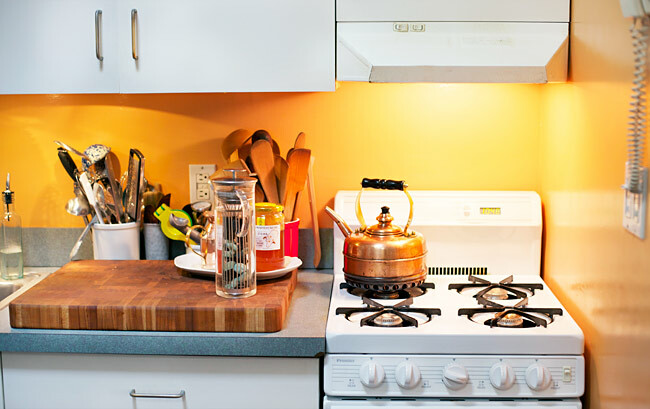 You’ll find sizes that can sit between sink and stove, or it can rest atop the stove for food prepping. So it’s doing double duty—acting as a countertop, but also as a cutting surface when needed. Fifth rule: Think up and down. The trick to maximizing storage space is using every inch wisely. Vertical space is perfect for hanging pot racks, which in turn will clear precious cabinet space for things that can’t hang (such as the waffle maker). 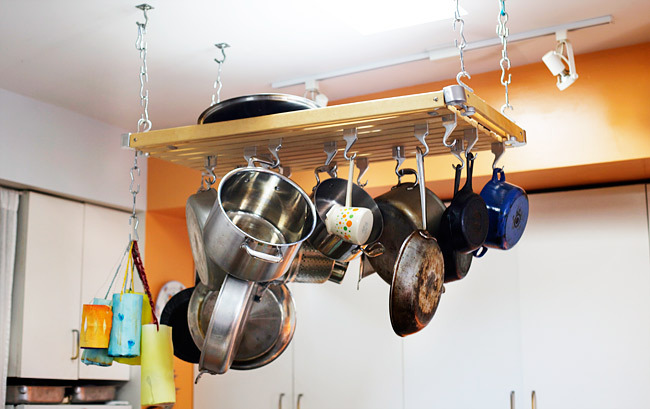 Hanging pots and pans also eliminates the inconvenience of nesting them, plus lids can be stored on top of the rack, reducing even more cabinet clutter. Sixth rule: Downsize as much as possible. And a great place to start is with a smaller fridge. A full-size fridge takes up a lot of space. If you own your apartment, consider replacing the fridge with a smaller model. If you rent, talk to your landlord. This idea implies more frequent shopping perhaps, but the bonus to that habit is fresher food always on hand!